As if boasting a top-notch school system and featuring some of Central Indiana´s most beautiful and affordable real estate isn´t enough, Noblesville is chock full of interesting things to do and see. We´ve compiled a list of our favorites. Try a few and we think you´ll agree that Noblesville has a lot to offer. 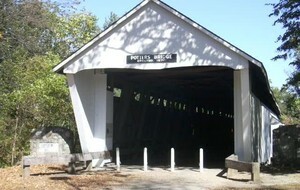 Potter´s Bridge Park is home to Hamilton County´s only remaining covered bridge. Built in 1870, Potter´s Bridge spans the scenic White River, and is open for visitors to stroll across while enjoying views of the surrounding park from open windows. The 30-acre park also marks the trailhead of the White River Greenway which parallels the White River and ends either in downtown Noblesville or at the Morse Park and Beach on Morse Reservoir where picnic areas and a canoe launch are available. Potter´s Bridge Park is located at 19401 Allisonville Road. For more information, call 317-896-5874. The Old Hamilton County Sheriff´s Residence and Jail has housed some notorious villains, including bank robber John Dillinger and Helter Skelter mastermind Charles Manson. Built in 1875, the jail closed for business in 1977 and today is home to the Hamilton County Museum of History. The museum is located at the corner of Eighth Street and Conner Street in downtown Noblesville. While you´re there, be sure to spend some time sampling the one-of-a-kind shops and eateries that line the city square. Museum hours are Thursday, Friday & Saturday, 10 a.m. to 4 p.m. Special tours are available by request. For more information, call 317-770-0775. Railways were once an integral part of Indiana´s transportation history. The Indiana Transportation Museum is dedicated to preserving that legacy through education programs, including opportunities to experience railroad travel firsthand! In addition to displays of refurbished locomotives, passenger cars and cabooses, the museum operates 38 miles of track upon which visitors can hitch a ride to destinations throughout Central Indiana. The Pizza Train transports families to a pizza buffet in Tipton, while Dinner in the Diner passengers are treated to a full four-course meal. Every August during the Indiana State Fair a train runs makes daily runs from the Fishers station to the state fairgrounds. For more information, including upcoming events, call 317-773-6000 or log on to www.itm.org. Spend a Day in Purgatory! Each summer, Indiana´s largest outdoor concert venue hosts the hottest music and entertainment acts in the industry, including annual engagements such as Van´s Warped Tour. The Verizon Wireless Music Center boasts approximately 6,000 covered seats and 18,000 lawn seats. The Klipsch Music Center (formerly Verizon Wireless Music Center) is located at 12880 E. 146th Street. Hamilton Town Center is a 1 million square foot open air shopping mall that includes popular retail shops and restaurants, a state-of-the-art 16 screen IMAX theater, and convenient proximity to the Klipsch Music Center, a hub for the latest and greatest music acts.